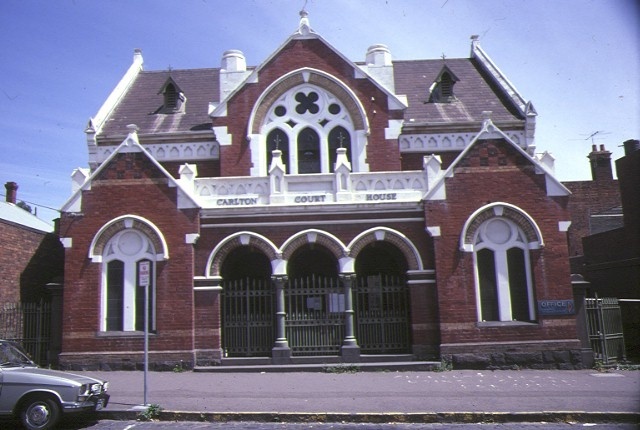 The Carlton Courthouse was constructed by John Short in 1887 to the design of Public Works Department architect GBH Austin. The building is a single-storeyed Gothic style structure composed in a symmetrical but picturesque form. Red face brick walls sit on a basalt plinth. Dressings are cream face brick, stone or stucco. The bulk of the building comprising the court room sits beneath a parapeted gable slate roof running parallel to the street. Large tracery pointed-arch windows light these gable ends. Two louvred gablets puncture the roof. The cornice incorporates a trefoil motif. A transverse parapeted gable with tracery window and flanking chimneys dominates the centre of the composition. A lower block sits in front of the main body of the building, comprising two chequerboard polychromatic gabled end porches linked by a three bay arcade with balustraded parapet. The Carlton Court House is of architectural and historical significance to the State of Victoria. The Carlton Court House is architecturally significant as a highly unusual Gothic style design by the Public Works Department. The Gothic style was not generally favoured by the Department during the 1880s and 1890s. The composition of intersecting transverse gables presents a strikingly bold facade to the street. 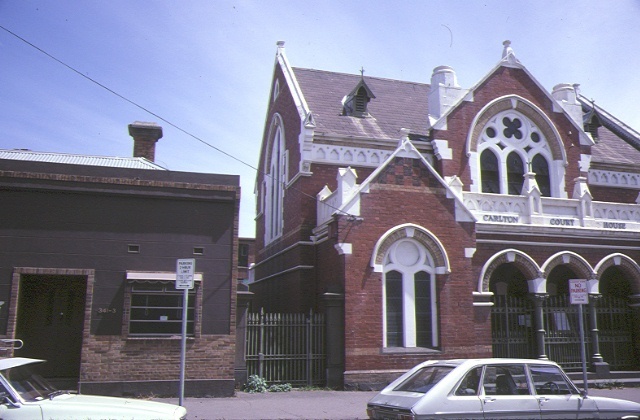 The Carlton Court House is historically significant as part of the civic core of Drummond Street. 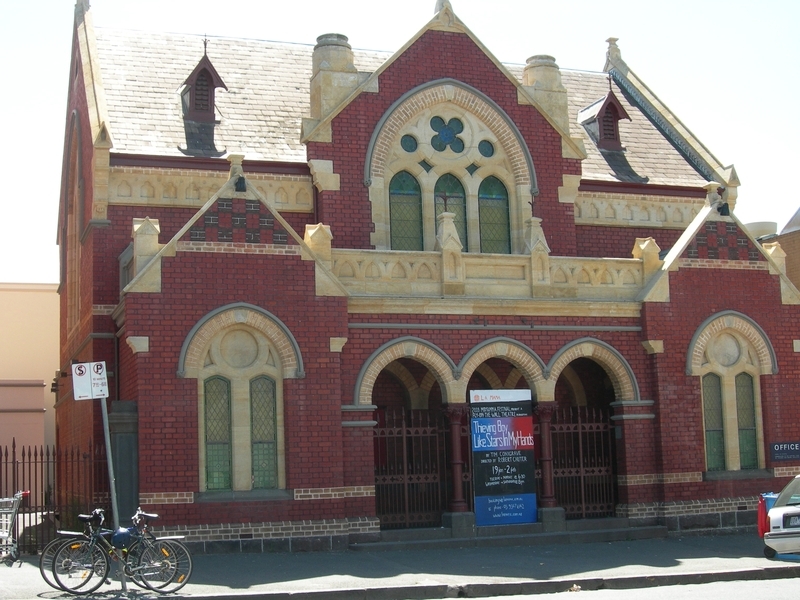 It is directly opposite the 1878 Carlton Police Station. The Court House was illustrative of the rise in the commercial and social status of the area in the 1880s. The Police Station and Court House are also reminders that the 19th century city was far from being an idyllic, trouble-free place, and that the expansion of settlement everywhere was accompanied by the expansion of the institutions of law and order. The Crown acquired the site in October 1885 for 1500 pounds. After many delays the Carlton Court House was finally opened on 19 March 1888 in the presence of John Gardiner, the member for Carlton. Since 1875 the Carlton Court House had operated from Carlton Hall, Princes Street (now demolished). The PWD architect G B H Austin practiced several styles. From 1885 to 1890 he designed several Elizabethan style post offices, at Geelong West (1885), Queenscliff (1885), Portarlington (1888) and Elsternwick (1890). The Gothic style for Carlton Court house probably derived from the Prahran Court House designed by Gilchrist in 1886. Austin changed style again to the Romanesque in 1910 for the design of the Melbourne Magistrates Court. The constant changing of architectural styles was part of the architect's skill in the nineteenth century. The so-called battle of the styles waged in Britain found a resonance in public architecture in Victoria. Institutions such as schools and courts favoured the Gothic style in Britain, and with the dismissal of chief architect William Wardell in 1878 the PWD in Victoria was freed from designing in a restrained classical manner and was able to experiment with other styles.